MOT test in Morden is basically carried out to ensure that all cars that are running on road for more than 3 years constantly are roadworthy, safe, properly continued and meets environmental standards and meets all safety rules. A MOT certificate gives the assurance that the car has been maintained properly and exceeded the safety standards. Car engine diagnostic in Morden covers all necessary components of your vehicle including indicators, steering, headlamps, wheels, seatbelts, brakes, tyres, windscreen washers & wipers, mirrors, bodywork, exhausts, emissions; everything that are necessary to be perfect for a successful MOT test. 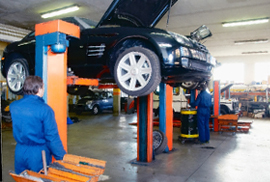 We get hundreds of thousands of MOT services every year in our car engine diagnostic in modern. MOT test in Morden is done by professional MOT testers in a designated test bay using a variety of MOT testing equipments to meet all the specification of the testing. If unfortunately your vehicle not succeed in the MOT test you will not get the pass certificate, rather you will be given a failure certificate and you will be recommended retest rules for your car. We provide fast online bioking for MOT test in Morden. According to UK Government rules you will not be able to drive your car legally on road until you meet the standards. If you car fails to pass the test you can opt for onsite repairing service but we will suggest you to perform the repairing task beforehand from Car engine diagnostic in Morden. Free MOT is available if the vehicle has failed the MOT and is left in the same testing station itself for repair/retest or if the vehicle fails because of one or more items from the MOT check points (Some checkpoints are excluded, please check with MOT station) and the vehicle is returned for re-test before end of next working day. Therefore, there is no reason to look further if you need MOT in Morden and a car engine diagnostic in Morden.